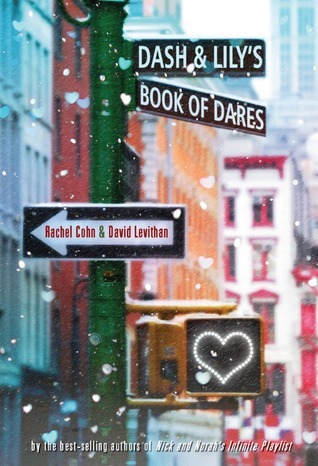 It´s kind of funny how difficult I found it to chose a sentence´cause for a book that I wanted to quote a lot -and I mean A LOT-, I didn´t enjoy Dash and Lily´s Book of Dares as much as I thought I would. As mentioned before, I found this book when looking for something to read in Christmas, and discovered it´s sequel The Twelve Days of Dash and Lily, so… I thought I should read this one before and waited ´til January. Turns out December was the perfect time to read this book, ´cause it´s basically set on Christmas week, but… as they say, there´s no point crying over spilt milk -or something like that-. But back to the book, though I liked the concept of dares going back and forth between the protagonist -kind of like in Since You´ve Been Gone-, and the idea of getting to know a person through their words -what they write- as well as the notion that sometimes the issue with relationships is that we build up people in our heads, and then get disappointed when they don´t live up to our expectations, to the image we have of them in our heads -which is where the quote above comes into play- where the book actually lost me was its characters. Dash, for example, was so pretentious and know it all, that at times it was cringe-worthy, but then again, aren´t plenty of teenagers like that? But in his defense, he did feel like a real teenage boy, which is hard to find in YA-Romance, ´cause usually they are written by women and though I love Rainbow Rowell for example, sometimes while reading her books I can´t help thinking “yeah…., I don´t think a real-life guy would act/speak/think that”, so I appreciated having a guy -David Levithan- writing. As for Lily…. gosh sometimes she was incredibly unbearable to me! I had flashbacks to Riley Matthews -Cory´s daughter in Girl Meets World– at her worst! Most of the time I felt like she was a 10-12-year-old stuck in a teenager´s body. And the way the family cuddle her! As I said, Riley Matthews at her worst, I mean she had her moments and I appreciated how good of a girl she was, but the rest of the time… at least in the end she seemed to have grown up a little, so… there´s that. Add that to the fact that after the first dares, the other ones seemed to escalate into over the top and awfully convenient, and that the book loses some steam halfway through, and yeah… it becomes kind of a chore to finish it. Therefore, right now I´m not sure If I´ll read the sequel, but.. we´ll see. Anyhow, what about you? Did you love the book? Am I missing something or do you agree with me? This entry was posted in Loved it/Hated it and tagged Books, christmasty, romance, weekly meme, young-adult by jewelgeekyshelf. Bookmark the permalink.